Since time immemorial, plants and their products have been the primary resource of food, shelter, clothing, flavors, fragrances as also valuable ingredients for medicines for mankind. In this context, natural resins have played an important role. These have also been used as adhesives, as ingredients for cosmetic preparations, as fragrances in daily rituals and in religious ceremonies, as coating materials and also for their different curative powers [1-3]. In ancient times, Hindus, Babylonians, Persians, Romans, Chinese and Greeks as well as the people of old American civilizations used natural resins primarily for embalming and for its incense in cultural functions. They firmly believed that when these materials get in contact with fire, the smoke and the fragrance they produce, not only soothe their souls but also please their gods. Burning of these natural resins had become an important component of their cultural life. They burned these resins during sacrificial ceremonies and in their daily rituals to prevent the influence of evil spirits on their souls or to honour the dead or living ones [4-6]. Boswellia serrata (Salai/Salai guggul) (Family: Burseraceae; Genus: Boswellia) is a moderate to large sized branching tree that grows in dry mountainous regions of India, Northern Africa and the Middle East [7,8]. The family of Burseraceae is represented in the plant kingdom with 17 genera and 600 species wide-spread in all tropical regions. There are about 25 known species belonging to Genus Boswellia, most of them occur in Arabia, northeastern coast of Africa and India. Since ancient times, three of these species have been considered as ‘true Frankincense’ producing trees [9,10]. Boswellia sacra Flueck, the first species, grows in South Arabia and is known amongst Arabians as ‘maghrayt d’ sheehaz’ and the resin produced is known as ‘luban dhakar’. Boswellia carterii Birdw, grows in Somalia and in the native language it is called ‘moxor’ and the resin produced is known as ‘luban dhakar’. Boswellia frereana Birdw., is also a Somalian species and in the native language it is called ‘jagcaar’ and the resin produced is known as ‘loban majdi’ or ‘maydi’. This is the most expensive brand of resin in the market . Another resin producing species is Boswellia serrata Roxb., known as ‘Indian olibanum’, ‘Indian frankincense’, ‘dhup’ and ‘salai’ or ‘salai guggul’ is found in the middle and northern parts of Eastern India. It has been available as a high quality extract in India for nearly 25 years and marketed under the name Shallaki. In India, the main commercial sources of Boswellia serrata are Andhra Pradesh, Gujarat, Madhya Pradesh, Jharkhand and Chhattisgarh. Regionally, it is also known by different names. The botanical origin and vernacular names of Boswellia serrata are given in Table 1. Salai, an oleo gum-resin, is a plant exudate of genus Boswellia (Family: Burseraceae). It is tapped from the incision made on the trunk of the tree, which is then stored in specially made bamboo basket. The semi-solid gum-resin is allowed to remain in the basket for about a month during which its fluid content locally known as ‘ras’ keeps flowing out. The residue, semi-solid to solid part, is the gum-resin which hardens slowly into amorphous, tear-shaped products with an aromatic scent. Then, it is broken into small pieces by wooden mallet or chopper and during this process all impurities including bark pieces etc. are removed manually. The gum-resin is then graded according to its flavour, colour, shape and size. Generally four grades i.e. Superfine, Grade I, Grade II and Grade III are available in the market. The fresh gum obtained from the tree is hot with pleasant flavour and slightly bitter in taste. It had been the ‘frankincense’ of ancient Egyptians, Greeks and Romans who used it as prized incense, fumigant as well as a multipurpose aromatic. It is generally used in making incense powder and sticks. Species: serrata Sanskrit: Ashvamutri, Kundara, Shallaki. Table 1: Botanical origin and vernacular names of boswellia serrata. The oleo gum-resins contain 30-60% resin, 5-10% essential oils, which are soluble in the organic solvents, and the rest is made up of polysaccharides (~ 65% arabinose, galactose, xylose) which are soluble in water [12-14]. The resins have a fragrant aroma because of the presence of essential oils and this accounts for their commercial importance. The essential oil of gum-resin is one of the most commonly used oils in aromatherapy, paints and varnishes. Pure oleo gum-resin collected in the optimum season hardens slowly, retaining its golden colour and transparency. But the colour varies from golden brown to dark brown or dark greenishbrown depending on the locality, season, size of the tree and the wound-surface, collection process and storage. Darkening of colour of resin is also due to autoxidation, polymerization and enzymatic reactions. The resin is generally harvested all through the summer and autumn after the tree has been wounded in March or April. Boswellia tree can produce exudates in good quality only for three years. After this period, the quality of the collected resin decreases considerably. Therefore, the tree should be left to rest for some years after harvesting period. Boswellia serrata is one of the ancient and most valued herbs in Ayurveda. “Gajabhakshya”, a Sanskrit name sometimes used for Boswellia, suggests that elephants enjoy this herb as a part of their diet . Three renowned ancient texts form the pillars of classical Ayurvedic Science, which has its roots in India: Charaka’s Charaka Samhita (c.B.C. 700), the first fundamental medical text; Susruta’s Susruta Samhita (c.B.C. 600), which attempted to amass the entire medical knowledge, with special focus on surgery; and the two-volume tome comprising Astanga Samgraha and Astanga Hridaya (c.130-200 A.D.), written by Vagbhata the Elder and Vagbhata the Younger, which synthesized the works of Charaka and Susruta and summarized the eight parts of Ayurveda in prose and verse forms. The first two pillars of Ayurveda describe the antirheumatic (antiarthritis) activity of gugguls-the gum-resins of trees [16-20]. In addition to its beneficial use for arthritis, this gummy resin is also mentioned in traditional Ayurvedic and Unani texts as an effective remedy for diarrhoea, dysentery, ringworm, boils, fevers (antipyretic), skin and blood diseases, cardiovascular diseases, mouth sores, bad throat, bronchitis, asthma, cough, vaginal discharges, hair-loss, jaundice, hemorrhoids, syphilitic diseases, irregular menses and stimulation of liver. It is also diaphoretic, astringent, diuretic and acts both as internal and external stimulant. Modern medicine and pharmacology strongly point out to its use as an antiarthritic, antiinflammatory, antihyperlipidemic (controls blood lipids), antiatherosclerotic (anticoronary plaque), analgesic (pain-reliever) and hepatoprotective (protects the liver) [15,21-24]. The resinous part of Boswellia serrata contains [25-31], monoterpenes (α-thujene); diterpenes (macrocyclic diterpenoids such as incensole, incensole oxide, iso-incensole oxide, a diterpene alcohol [serratol]); triterpenes (such as α- and β-amyrins); pentacyclic triterpenic acids (boswellic acids); tetracyclic triterpenic acids (tirucall-8,24-dien-21-oic acids). The structures of four major pentacyclic triterpenic acids (boswellic acids) as also some of their characteristic features are given in fig. 1 and Table 2, respectively . β-Boswellic acid, R1=H, R2=H2; acetyl-β-boswellic acid, R1=Ac, R2=H2; 11-keto-β-boswellic acid, R1=H, R2=O; acetyl-11-keto-β-boswellic acid, R1=Ac, R2=O. Table 2: Some of the characteristic features of four pentacyclic triterpenic acids (boswellic acids). In vitro studies and animal models show that boswellic acids were found to inhibit the synthesis of pro-inflammatory enzyme, 5-lipoxygenase (5- LO) including 5-hydroxyeicosatetraenoic acid (5- HETE) and leukotriene B4 (LTB-4), which cause bronchoconstriction, chemotaxis, and increased vascular permeability [33-38]. Other antiinflammatory plant constituents, such as quercetin, also block this enzyme, but they do so in a more general fashion, as an antioxidant, where as boswellic acids seem to be specific inhibitor of 5-LO . 5-LO generates inflammatory leukotrienes, which cause inflammation by promoting free radical damage, calcium dislocation, cell-adhesion and migration of inflammation-producing cells to the inflamed body area. In contrast to non-steroidal antiinflammatory drugs (NSAIDS), which are well known to disrupt glycosaminoglycan synthesis, thus accelerating articular damage in arthritic conditions, boswellic acids have been shown to significantly reduce glycosaminoglycan degradation [40-43]. In vivo study examining the effect of Boswellia extract and ketoprofen on glycosaminoglycan metabolism showed that Boswellia considerably reduced the degradation of glycosaminoglycans compared to controls, whereas ketoprofen caused a reduction in total tissue glycosaminoglycan content . In vitro studies by Ammon et al. in 1993 also elucidated that boswellic acids were found to inhibit leukotriene synthesis via 5-LO, but did not affect the 12-lipoxygenase or cyclooxygenase activities, nor did they prevent peroxidation of arachidonic acid by iron or ascorbate. Boswellic acids were, therefore, shown to be specific, non-redox inhibitors of leukotriene synthesis, either interacting directly with 5-LO or blocking its translocation [45,46]. Boswellic acids have also been observed to inhibit human leukocyte elastase (HLE), which may be involved in the pathogenesis of emphysema. HLE also stimulates mucus secretion and thus may play a role in cystic fibrosis, chronic bronchitis and acute respiratory distress syndrome [47,48]. HLE is a serine protease, which initiates injury to the tissues which, in turn, triggers the inflammatory process. This dual inhibitory action on the inflammatory process is unique to boswellic acids. Of these four boswellic acids, 3-acetyl-11-keto-β-boswellic acid (AKBA) is the most potent inhibitor of 5-LO, an enzyme responsible for inflammation. Singh et al. studied the antiinflammatory activity of mixture of boswellic acids and observed 25- 46% inhibition of paw oedema in rats and mice. They have also reported that in chronic test of formaldehyde arthritis it exhibited 45-67% antiarthritic activity in a similar dose range. The fraction was effective in both adjuvant arthritis (35-59%) as well as established arthritis (54-84%). It also showed antipyretic effect, with no ulcerogenic effect. Kulkarni et al. and Chopra et al. have reported clinical trials of Boswellia’s antiinflammatory properties in combination with Withania somnifera, Zingiber officinate and Curcuma longa and the isolated effects of Boswellia on rheumatoid arthritis could not be revealed [50,51]. However, the clinical trials of gum-resin of Boswellia alone have shown to improve symptoms in patients with osteoarthritis, and rheumatoid arthritis [52,53]. The boswellic acid from Boswellia serrata, when tested on new model i.e. Papaya Latex Model, showed significant activity of mean 35% inhibition of inflammation. Since the new model is reported to be sensitive to slowly acting remission-inducing drugs, its effectiveness on boswellic acid throws some light on its mechanism of action, which seems to be unlike aspirin and steroidal drugs . Poeckel and Werz in 2006 have summarized the biological actions of boswellic acids on the cellular and molecular level and attempted to put the data into the perspectives of the beneficial effects manifested in animal studies and trials with human subjects related to inflammation and cancer . Sharma et al. have reported the effect of boswellic acids on bovine serum albumin (BSA)- induced arthritis in rabbits. Gayathri et al. in 2007 have reported that pure compound from Boswellia serrata extract exhibits antiinflammatory property in human peripheral blood mononuclear cells (PBMCs) and mouse macrophages through inhibition of tumor necrosis factor-alpha (TNF-alpha), interleukin-1beta (IL-1beta), NO and mitogen activated protein (MAP) kinases. Incensole acetate, a novel antiinflammatory compound isolated from Boswellia resin inhibits nuclear factor-kappa B activation . Boswellic acids are direct 5-LO inhibitors that efficiently suppress 5-LO product synthesis in common in vitro test models. However, the pharmacological relevance of such interference in vivo seems questionable . Acetyl-11-keto-β- boswellic acid inhibits prostate tumor growth by suppressing vascular endothelial growth factor receptor 2- mediated angiogenesis . A clinical trial conducted by Raychaudhuri and co-workers in India has shown that the extract of the plant, Boswellia serrata, can reduce pain and considerably improve knee-joint functions, in some cases providing relief even within seven days. Raychaudhuri and her colleagues described their study as the first to evaluate the efficacy of the extract enriched with a form of boswellic acid on osteoarthritis . Very recently, Pawar et al. in 2011 have reported a simple, rapid, accurate, reproducible, selective and economic HPTLC method for routine quality control analysis as also quantitative determination of β-boswellic acid from Boswellia serrata Roxb. (exudate) and its formulations . Boswellia is generally taken as a capsule, tablet or its bark decoction orally. The recommended dosage is based on historical practice or available trials. Presently, it is not clear what the optimal dose is to balance safety and efficacy. The manufacturing of Boswellia products varies from one produce to the other and this makes it even more difficult for standardization to happen. It is important to note that most of the trials used various products made by various manufacturers, so clinical effects may not be comparable [63,64]. Boswellin®, a registered trademark by Sabinsa Corporation, introduced to the US and European markets in 1991. This is available in capsules or tablets, and also in a soothing pain relieving cream containing capsaicin. Products containing boswellic acids range from 150-250 mgs/capsules or tablets, and are taken orally two to three times a day. Shallaki®, contains 125 mg Boswellia serrata in each capsule manufactured by Himalayan Drug Company, Makali, Bangalore, as Licensed User of the Trade Mark owned by MMI Corporation, has excellent antiinflammatory and analgesic properties, useful in relieving joint-pains. 60 capsule costs Rs. 75/- and the dose is 1 capsule twice daily (Batch No. F297001G). The website of the company is www. himalayahealthcare.com. Niltan®, is a cream in a 15 g tube for external application. Manufactured by Dr. Reddy’s Laboratories Limited, Hyderabad, it is a combination of active herbal extracts (boswellin, arbutin, liquorice extract and coriander seed oil in a cream base). It reduces the activity of the enzyme tyrosinase within the skin, thus diminishing the production of melanin, which results in the reduction of dark skin formation. Rheumatic-X®, contains 20 mg ‘Shallaki’ besides a number of ingredients, manufactured by Sunrise Herbals, Varanasi (U.P., India), meant for rheumatoid, gouty, osteoarthritis and sciatic pain, two capsules twice daily or as directed by the physician. The resin of Boswellia species ('frankincense', 'olibanum') has been used as incense in religious and cultural ceremonies since time immemorial. Its medicinal properties are also widely recognized, mainly for the treatment of inflammatory conditions, as well as in some cancerous diseases, wound healing and its antimicrobial activity. Despite its historical, religious, cultural and medicinal importance, Boswellia has not been thoroughly studied, and gaps still exist between our knowledge of the traditional uses of the resin and the scientific data available. Traditional system of medicine continues to be widely practised for various reasons. Fast population-growth, inadequate supply of branded medicines, alarmingly prohibitive cost of treatment, adverse side-effects of several allopathic drugs and ever-increasing resistance to current drugs for infectious diseases have led to growing emphasis on the use of plant-materials as a source of medicines for a wide variety of human ailments. However, a sustained and uninterrupted supply of the source-materials often becomes difficult due to various factors like environmental variations, local cultural practices, diverse geographical distribution, increasing labourcost, non-selection/improper selection of the suitable plant-stock and prevalent exploitative practices by pharmaceutical industry. A fully integrated approach for the cultivation, conservation and preservation of important plant-species through plant molecular biology, plant-tissue culture techniques, both extensive and intensive research on the rationality and methodology of Ayurvedic practices, isolation of the active constituents and their development into new therapeutics, standardization and validation of known herbal medicines and other related aspects need to be continuously focused upon. In fact, the time has come when our medicinal discoveries must move in mighty leaps and bounds, if the human race is to be saved from the onslaughts of continuously multiplying maladies. Anon (CSIR). The Wealth of India, Raw Materials, Vol. 1, New Delhi: Council of Scientific and Industrial Research; 1948. Felter H, Lloyd J. Kings American Dispensatory, Vols. I and II, Cincinnati: Ohio Valley Company, US, 1898. Howes FN. Age-old resins of the Mediterranean region and their uses. Econ Bot 1950;4:307-16. Krishnamurthy T, Shiva MP. Salaiguggul (from BoswelliaserrataRoxb. ): Its exploitation and utilization. Indian Forest 1977;103:466-74. Verghese J. Olibanum in focus. Perfumer Flavorist 1988;13:2-11. Holmes P. Frankincense oil. Int J Arom 1999;9:56-61. Maupetit P. New constituents in olibanumresinoid and essential oils. Perfumer Flavorist 1984;9:19-37. Leung AY, Foster S. Encyclopedia of common natural ingredients used in food, drugs and cosmetics. 2nd ed. New York: John Wiley and Sons; 1996. p. 389-91. Wallis TE. Textbook of Pharmacognosy. 5th ed. London: J and A Churchill Limited; 1967. p. 500-1. Evans WC. Trease and Evans Pharmacognosy. 14th ed. London: WB Saunders Company Ltd; 1996. p. 289. Chiavari G, Galletti GC, Piccaglia R, Mohamud MA. Differentiation between resins from Boswelliacarterii and Boswelliafrereana (Frankincense) of Somali region. J Essential Oil Res 1991;3:185-6. Sharma RA, Verma KC. Studies on gum obtained from BoswelliaserrataRoxb. Indian Drugs 1980;17:225. Bhuchar VM, Agarwal AK, Sharma SK. Constituents of gum obtained from Boswelliaserrata exudates. Indian J Technol 1982;20:38. Gangwal ML, Vardhan DK. Carbohydrate contents of Boswelliaserrata. Asian J Chem 1995;7:677. Sharma S, Thawani V, Hingorani L. Pharmacokinetic study of 11-keto-beta-boswellic acid. Phytomedicine 2004;11:255-60. Monograph Boswelliaserrata. Altern Med Rev 1998;3:306-7. Kirtikar KR, Basu BD. The antiinflammatory action of Indian medicinal plants. Indian Med Plants 1935;1:521-9. Chatterjee GK, Pal SD. Antiinflammatory agents from Indian medicinal plants. Indian Drugs 1984;21:431. Khare CP. Encyclopedia of India, Rational Western Therapy, Ayurvedic and other Traditional Usage. 2004. Pharmacopoeia of India, Govt. of India, New Delhi: Ministry of Health and Family Welfare; 2007. p. 2045. Dhiman AK. Ayurvedic Drug Plants. Delhi: Daya Publishing House; 2006. p. 326-7. Hostanska K, Daum G, Saller R. Cytostatic and apoptosis-inducing activity of boswellic acids toward malignant cell lines in vitro. Anticancer Res 2002;22:2853-62. Lemenih M, Teketay D. Frankincense and myrrh resources of Ethiopia: Medicinal and industrial uses. Ethiop J Sci 2003;26:161-72. Mathe C, Culioli G, Archier P. Characterization of archeological frankincense by gas chromatography mass spectrometry. J Chromatogr 2004;1023:277-85. El-Khadem H, El-Shafei ZM, Elsekeify MA, Abdel Rahman MM. Derivatives of boswellic acids. Planta Med 1972;22:157-9. Pardhy RS, Bhattacharyya SC. Tetracyclic triterpene acids from theresin of BoswelliaserrataRoxb. Indian J Chem 1978;16B:174-5. Pardhy RS, Bhattacharyya SC. 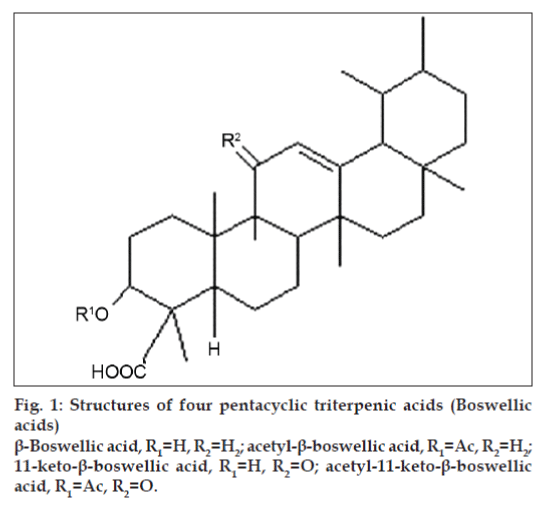 β-Boswellic acid, acetyl- β-boswellic acid, acetyl-11-keto-β-boswellic acid and 11-keto-β-boswellic acid, four pentacyclictriterpenic acids from the resin of BoswelliaserrataRoxb. Indian J Chem 1978;16B:176-8. Mahajan B, Taneja SC, Sethi VK, Dhar KL. Two triterpenoids from Boswelliaserratagum resin. Phytochemistry 1995;39:453-5. Handa SS. Herbal raw material and traditional remedies. Eastern Pharmacist 1995;3:24. Choudhary AC, Dikshit SK. Ayurvedic Pharmacopoeia. Eastern Pharmacist 1999;10:52. Sane RT. Standardization, quality control, and GMP for herbal drug. Indian Drugs 2002;39:184-90. Safayhi H, Mack T, Sabieraj J, Anazodo MI, Subramanian LR, Ammon HP. Boswellic acids: Novel, specific, non-redox inhibitors of 5-lipoxygenase. J PharmacolExpTher 1992;261:1143-6. Ammon HP, Mack T, Singh GB, Safayhi H. Inhibition of leukotriene B4 formation in rat peritoneal neutrophils by an ethanolic extract of gum-resin exudates of Boswelliaserrata. Planta Med 1991;57:203-7. Wildfeuer A, Neu IS, Safayhi H, Metzger G, Wehrmann M, Vogel U, etal. Effects of boswellic acids extracted from a herbal medicine on thebiosynthesis of leukotrienes and the course of experimental autoimmune encephalomyelitis. ArzneimForsch 1998;48:668-74. Ammon HP. Boswellic acids (components of frankincense) as the active principle in treatment of chronic inflammatory diseases. Wien Med Wochenschr 2002;152:337-78. Ammon HP. Boswellic acids in chronic inflammatory diseases. Planta Med 2006;72:1100-16. Schweizer S, von Brocke AF, Boden SE, Bayer E, Ammon HP, Safayhi Workup-dependent formation of 5-lipoxygenase inhibitory boswellic acids analogues. J Nat Prod 2000;63:1058-61. Etzel R. Special extract of boswelliaserrata (H15) in the treatment of rheumatoid arthritis. Phytomedicine 1996;3:91-4. Ammon HP. Salaiguggul-Boswelliaserrata from a herbal medicine to a specific inhibitor of leukotriene biosynthesis. Phytomedicine 1996;3:67-70. Lee KH, Spencer MR. Studies on mechanism of action of salicylates V: Effect of salicylic acid on enzymes involved in mucopolysaccharide synthesis. J PharmacolSci 1969;58:464-8. Palmowski MJ, Brandt KD. Effect of salicylate on proteoglycan metabolism in normal canine articular cartilage in vitro. Arthritis Rheum 1979;22:746-54. Dekel S, Falconer J, Francis MJ. The effect of anti-inflammatory drugs on glycosaminoglycan sulphation in pig cartilage. Prostaglandins Med 1980;4:133-40. Brandt KD, Palmowski MJ. Effect of salicylates and other non-steroidal anti-inflammatory drugs on articular cartilage. Am J Med 1984;77:65-9. Reddy GK, Chandraksan G, Dhar SC. Studies on the metabolism of glycosaminoglycans under the influence of new herbal ant-inflammatory agents. Biochem Pharm 1989;38:3527-34. Ammon HP, Safayhi H, Mack T, Sabieraj J. Mechanism of anti-inflammatory actions of curcumine and boswellic acids. J Ethnopharmacol 1993;38:113-9. Safayhi H, Sailer ER, Ammon HP. Mechanism of 5-lipoxygenase inhibition by acetyl-11-keto-boswellic acid. MolPharmacol 1995;47:1212-6. Rall B, Ammon HP, Safayhi H. Boswellic acids and protease activities. Phytomed 1996;3:75-6. Safayhi H, Rall B, Sailer ER, Ammon HP. Inhibition by boswellic acids of human leucocyte elastase. J PharmacolExpTher 1997;281:460-3. Singh GB, Atal CK. Pharmacology of an extract of salaiguggul ex-Boswelliaserrata. Indian J Pharmacol 1984;16:51. Kulkarni R, Patki P, Jog V, Gandage S, Patwardhan B. Treatment of osteoarthritis with a herbomineral formulation: A double blind, placebo-controlled, cross-over study. J Ethnopharmacol 1991;33:91-5. Chopra A, Lavin P, Patwardhan B, Chitre D. Randomized double blind trial of an Ayurvedic plant derived formulation for treatment of rheumatoid arthritis. J Rheumatol 2000;27:1365-72. Murray MT. The Healing Power of Herbs. Rocklin, CA: Prima Publishing; 1995. p. 327-35. Arora RB, Kapoor V, Basu N, Jain AP. Anti-inflammatory studies on Curcuma longa (turmeric). Indian J Med Res 1971;50:1289-95. Gupta OP, Sharma N, Chand D. A sensitive and relevant model for evaluating antiinflammatory activity – papaya latex-induced rat paw edema. J PharmacolToxicol Methods 1992;28:15-9. Poeckel D, Werz O. Boswellic acids: Biological actions and molecular targets. Curr Med Chem 2006;13:3359-69. Sharma ML, Bani S, Singh GB. Anti-arthritic activity of boswellic acids in bovine serum albumin (BSA)-induced arthritis. IntImmunopharmacol 1989;11:647-52. Gayathri B, Manjula N, Vinaykumar KS, Lakshmi BS, Balakrishnan A. Pure compound from Boswelliaserrata extract exhibits antiinflammatory property in human PBMCs and mouse macrophages through inhibition of TNF alpha, IL-1beta, NO and MAP kinases. IntImmunopharmacol 2007;7:473-82. Moussaieff A, Shohami E, Kashman Y, Fride E, Schmitz ML, RennerF, et al. Incensole acetate, a novel anti-inflammatory compound isolated from Boswellia resin inhibits nuclear factor-kappa B activation. MolPharmacol 2007;72:1657-64. Siemoneit U, Pergola C, Jazzar B, Northoff H, Skarke C, Jauch J, et al. On the interference of boswellic acids with 5-lipoxygenase:Mechanistic studies in vitro and pharmacological relevance. Eur J Pharmacol 2009;606:246-54. Pang X, Yi Z, Zhang X, Sung B, Qu W, Lian X, et al. Acetyl-11-keto-β-boswellic acid inhibits prostate tumor growth by suppressing vascular endothelial growth factor receptor 2-mediated angiogenesis. Cancer Res 2009;69:5893-900. Anonymous. Indian herb hope for arthritis relief. The Telegraph Calcutta, 4 August, 2008. p. 7. Available from: http://www. telegraphindia.com/1080804/jsp/nation/story_9643877.jsp#top, [Last accessed on 2011 May 18]. Pawar RK, Sharma S, Singh KC, Sharma RK. Physico-chemical standardization and development of HPTLC method for the determination of β-boswellic acid from BoswelliaserrataRoxb. (exudate). Int J App Pharm 2011;3:8-13. Basch E, Boon H, Davies T, Hashmi S, Hasskari J, Sollars D, et al. Boswellia: A evidence based systematic review by the naturalstandard research collaboration. J Herb Phar 2004;4:63-83. Dabur Research Foundation and DaburAyurved Limited. Major herbs of Ayurveda. New York: Churchill Livingston; 2002.